This year we’ll be working with the Timucuan Parks Foundation with some “lopping and chopping” to clear the extensive biking and hiking trails at Hanna Park. We’ll meet up just before 9am on Saturday, March 30th and be grouped with members of SORBA (The Southern Off-Road Biking Association) to guide us to the trails most in need of our help. We’ll be cutting branches, clearing brush, and dragging it all off the trails. They have had girl and boy scout groups with 5 year old kids doing this work in the past, so age shouldn’t limit anyone’s ability to participate. 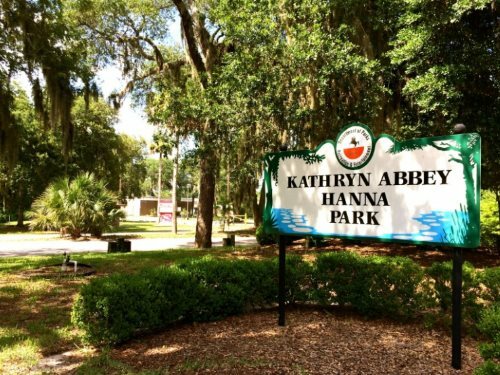 After the work is done, we’re free to enjoy Hanna Park and stay until it closes. Hiking, biking, canoeing, beach, picnic in the park, whatever you want. The boys had so much fun at Hanna Park for their last spring longhouse that they’re going back this spring. If your girls haven’t been, you should spend the day to preview the Spring Longhouse venue. Not only is park admission free that day, but we have also arranged for free camping the night after our service project. Saturday night, we have room for 30 people to camp in the special scouting area of the park. This is primitive camping only, so there will not be electricity and no campers/popups are allowed. Last, but not least, the UNF Astronomy students will be present on Saturday night to let our kids look through their fancy telescopes. You really don’t want to miss that. This is the only Federation-sponsored service project this year. Remember that two service projects are required to qualify for OWB. Let’s show up in force, and help make a difference in “forest, field, and stream” this year. Please sign up on CircleBridge before March 20th to participate in the service project and for the optional camping.